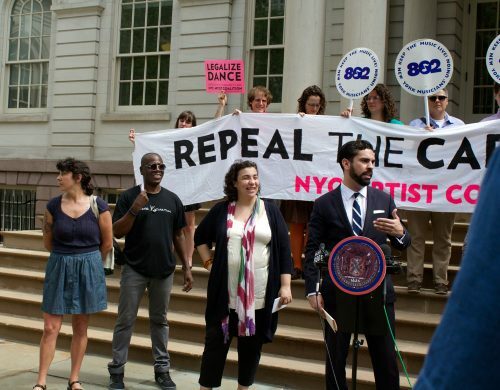 Before the hearing, Espinal, of East New York, held a press conference on the steps of City Hall where he was joined by representatives from the groups mobilizing to repeal the cabaret law: the NYC Artist Coalition, Dance Liberation Network, Legalize Dance NYC, and the Dance Parade. It was just the latest in a series of efforts by this recently formed coalition to eliminate the Prohibition-era law. Previously, they hosted small discussion-oriented meetings and drew hundreds to Market Hotel to speak with the Commissioner of the New York City Department of Cultural Affairs. “I choose to be an artist and play music, and I need a place to do that,” DJ Ali Coleman said. 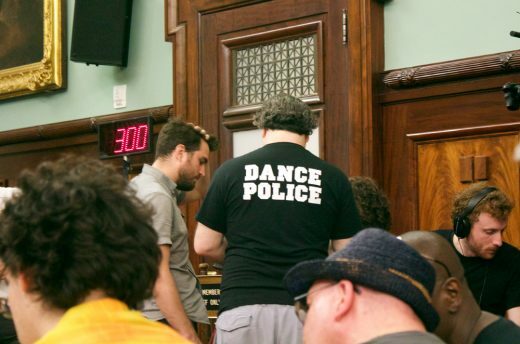 “And with this law, it’s making less and less of those places exist.” Coleman, who has been involved with the Dance Parade since its inception, easily details repeated times he’s seen venues shut down or interrupted. When “the lights come on,” he said, it only means trouble. The City Council members present for the hearing were Stephen Levin, Corey Johnson, Antonio Reynoso, Rory Lancman, and Karen Kozlowitz. Over half of them, plus Espinal himself, are under the age of 40. First to testify was Frankie Hutchinson, of inclusive electronic music collective and booking agency Discwoman and Dance Liberation Network. She emphasized the “racist intent” of the cabaret law, which used to also require musicians to carry “cabaret cards” in order to perform, and formerly barred more than three musicians performing at a time, which she said disproportionately affected black jazz musicians. “Who has this law historically penalized, and why are we holding onto a law that did this?” she asked the packed house, alleging the law has a “like-mindedness” to Jim Crow. Though safety is a concern when there is talk of removing any regulation, those in favor of cabaret law repeal, like lawyer and venue owner Andrew Muchmore, argue that safety regulations encompassed by the cabaret law exist elsewhere. Andrew Muchmore, who recently hosted a discussion on the cabaret law at his Williamsburg venue Muchmore’s, testified that if he was not a lawyer he would not have been able to open a space, as regulations in New York City are so prevalent and complex. Echoing Hutchinson’s criticisms of the law as racist, he said he’s “required to censor music genres that might lead to dancing” in his venue’s programming, stating these genres are often tied to music historically produced by people of color. Even with his curatorial caution and legislative know-how, Muchmore states he was cited for violating the cabaret law in 2013. One year later, he filed a lawsuit against the city, claiming the cabaret law was unconstitutional with regard to the First and 14th Amendment. “We live in paranoia and constant fear of our city government,” stated John Barclay, a Brooklyn venue owner. As such, he did not disclose his venue’s name during his testimony. Muchmore’s lawsuit provided an interesting scapegoat for those at the Mayor’s Office. Despite repeated questioning by Espinal and other Council members like Stephen Levin of District 33, Mayoral Adviser Lindsay Greene of the Office of Housing and Economic Development largely avoided divulging any specifics regarding the administration’s thoughts on the cabaret law and other nightlife issues, citing pending legislation. She said they “don’t intend” for enforcement of the law to be discriminatory, but was unable to list any violations of the law during the past term or describe who they may have affected. Levin also asked if the de Blasio administration was defending the lawsuit, and Greene said that it was. After Levin articulated that the administration was “not under legal obligation” to defend the lawsuit, Greene only articulated again that that was what they were doing. 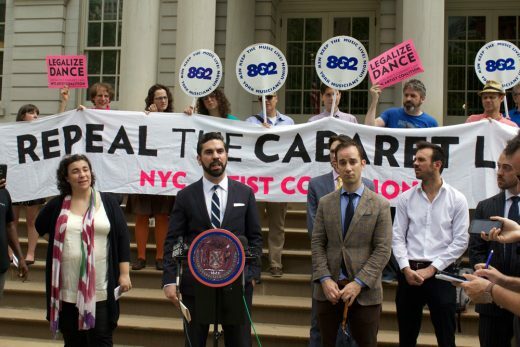 If Espinal’s Night Mayor and task force proposals are successful but cabaret law repeal is not, venue owners may still fear that any efforts and finances put toward legality will be in vain if they offer social dancing. A mayoral spokesman told Gothamist yesterday they are “looking forward to working with Espinal on his nightlife legislation package,” assuring that their priority was the safety and security of New York City residents. 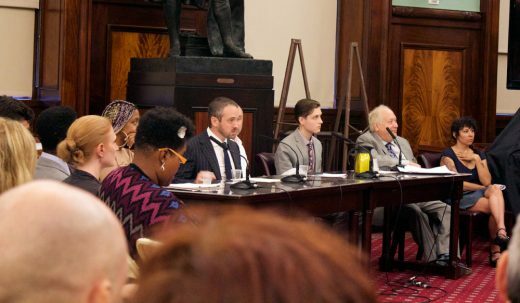 As dozens of people, from artists and venue operators to community board members and union directors, testified on all of these topics, the hearing stretched from 1 pm all the way until 6 pm. 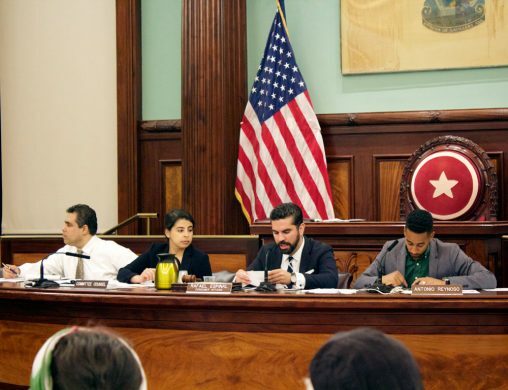 Council Member Espinal stated multiple times that he was in favor of a “full repeal” of the cabaret law, and that he intended to introduce a bill to repeal and replace the law on Wednesday.